Brylee and I headed to the lake Friday afternoon... she was so excited to see her cousins and get ready for a super fun weekend at the lake. Granny and Pap Pap got Daddy and Uncle Donnie's bunk beds out of storage from when they where little boys, cleaned them up, and set them up for the crazy cousins to sleep on! 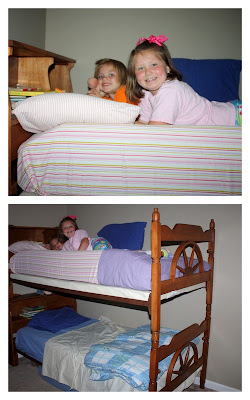 They all thought they bunk beds were so cool!